This is How to Make an Acoustic Guitar – Part 6 – Bracing the Back Plate. In this part of the series you will learn how to brace the back plate as well as cutting and fitting a center seam overly. Plus lots of great tips of course. Enjoy. The back plate on an acoustic guitar is a very important part of the overall structure. The back plate holds its half of the body in place, and has a nice domed structure. This is for a couple of good reasons, and they all help the guitar perform better. First of all, a domed structure is one of the most stable and powerful structures and all of nature. A dome distributes force around its rim, and is much stronger than a large flat surface of similar size and shape. Since the back plate of an acoustic guitar acts somewhat like a baffle, redirecting sound and vibration forward towards the soundboard, the dome is also advantageous. This shape naturally aids in reflecting sound and vibration. More redirection means more sound and depth of sound. Since the back of the guitar plays more of a supporting role for creating sound, it needs to be braced more structurally then anything else. Where as the top requires a lot of fine detail in order to get the right sound, the back does not. 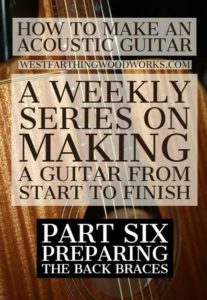 It’s very important that you follow the bracing strategy that is outlined in your plans or the book that you’re using to make your guitar. My guitar may be a little different, and it may not work in conjunction with the plans that you were following. In the beginning, it’s dangerous to combine too many different books, ideas, or sets of plans on one guitar. Many times, the different steps or stages are tied together and if you don’t do them the right way, you could end up with results that you were not intending. My way of doing things has to do with this particular guitar. I believe that it will work in most cases and for most sets of plans. 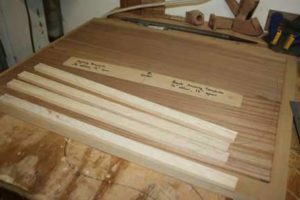 However it’s important to use this post as a guideline and use the dimensions in your plans when you make your guitar. This is good advice to follow in general. Until you’ve made a few instruments, you may not notice the small differences that will end up making a big difference in the end. Once you are more rounded in your guitar making, it will be easier to spot the differences. The back of the guitar has a slight dome shape. This is accomplished by carving the bottoms of the braces to have a curve. It’s a really straightforward process, and it’s a lot easier than you think even for a beginner. First, cut all of your braces to width, and leave them the same length. 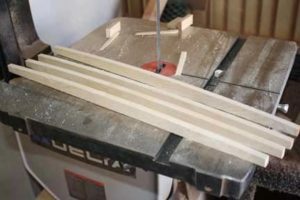 It’s important for the arch that you leave them all the same length until they are done being curved. For most guitars, this is a 16 inch minimum length. Now that you have all the braces the same size, square them up and put a tiny drop of wood glue on the faces to tack them together lightly. 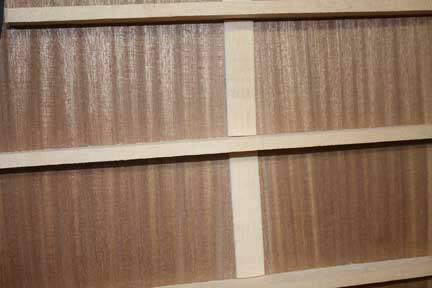 The point is to hold them together while you sand or plane, not to permanently glued them. You should use a very tiny drop of glue on two or three spots between the braces. Any more than this is too much to pull them apart, and any less may cause the block to fall apart during the curving process. Refer to your plans, and draw the radius on one side of that block, and then the other. Use a hand plane, belt sander, sanding block, or any other method to create a nice even curve on your braces. Do them all at once, it’s a lot easier that way. Every once in a while check for squareness, and make sure that the process is going along well. Once you are done, use a thin knife to pry the braces a part into individual sticks. Now, cut your braces to the appropriate length depending on where they will go on the guitar. Make sure to cut the same amount of material from both ends of the braces when you shorten them, as that will preserve the shape of the curve. Measure and mark the brace locations on your back plate. This is important for later on because it will make the process a lot easier when you glue them down. Knowing where they go is just one less thing to get in your way. Measure and mark exactly where the braces need to be. Mark the full length from end to end on the back plate so that way there is no question wear that brace goes. Use a thin pencil line, and don’t press too hard so you don’t mar the surface. It’s important to establish a reference point before you do your measuring. Find a spot right near the top on the center line where you can measure from. This will become the edge of your guitar once the body is built. Make all your measurements from that point, and they will be a lot more consistent. For example, measuring from brace to brace can cause a problem if your first measurement is off. In contrast, measuring from one location doesn’t compound mistakes. 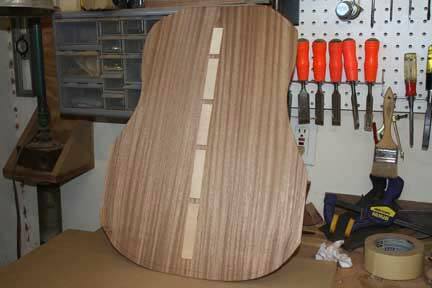 The center joint on the acoustic guitar back plate is a very long, and very thin joint. 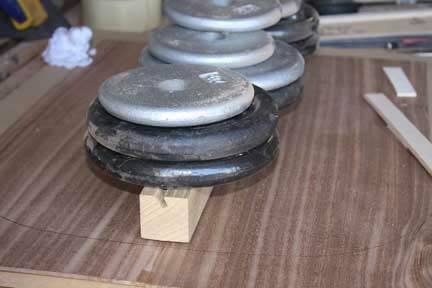 It can use a little help being stronger, and that’s where your center seam overly comes in. This can be a portion of soundboard cut the right way, and it goes over the center seam. 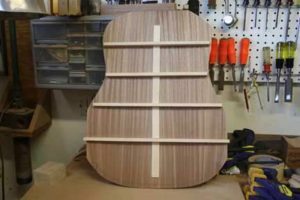 The grain will be running up and down when you look at the back plate, so it’s important to cut pieces of soundboard or scrap where the grain runs perpendicular to that center seam. Cut these pieces anywhere from 3/4 of an inch to 1 inch wide. Glue this down in either one long strip, or individual pieces that cover the gap’s completely in between the different brace locations. You don’t have to cover them completely, you can just go over the line and then trim it back later. The same goes for the head and tail blocks. You don’t have to go all the way through. 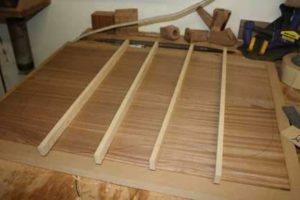 Simply make sure that you cross the line where your tail block and head black will end up living when you glue down the strips. It’s easiest to glue them down a few at a time, but if you’re nervous you can glue them down one at a time. You don’t need a ton of pressure either, just a good caul and some weights on top to press them in position while the glue dries. 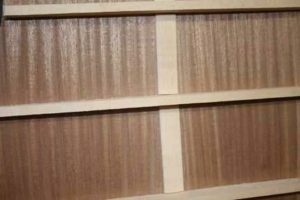 You can carve them to shape afterwards, but it’s helpful to round the left and right edges, which would be the end grain, before you glue them in place. 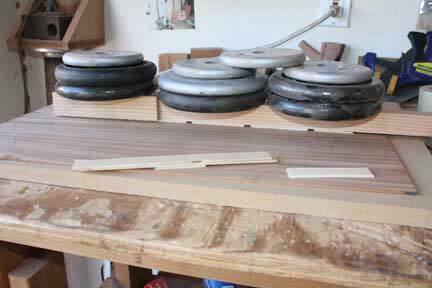 This is just one less thing to do with the soundboard in the way, and you can use a power sander. Once the center steam overlay has cured, remove all of your clamps or calls and take a look at the job. 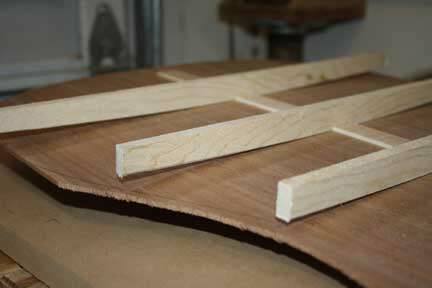 Make sure that there are no gaps, and that the pieces adhered really well. If any did not, chisel them off and redo them. Now it’s time to make room for the braces. The best way to do that is to use the individual braces themselves, and then a razor blade to mark the center seam overly portions that need to be removed. Do this one at a time, and clamp the brace in position so that way there are no chances of it moving during the marking phase. Mark the area that needs to go away with a razor blade knife, and make the thinnest mark you can possibly make. You don’t want to make really thick marks because you’ll end up removing too much material later on in the process. This will create a joint that’s not very good, because there will be gaps in between the overlay pieces and the braces. Once you have your marks in place, use a sharp chisel to remove the waste material and allow the brace to sit flush against the back plate. Test this out as you go, and it’s better to sneak up on the size then to accidentally go over it. Remember, you can always remove more wood. Yes, you can add wood back, but it involves chiseling out an entire piece of wood and replacing it completely. While not impossible, it’s a real pain, and a waste of time and energy. Repeat this process until all of the braces have been fitted, and then you’re ready to move onto the next step. Now it’s time to glue down the braces. Keep them in order from when you created the openings in between the center seam gaps, that way you don’t get them mixed up. 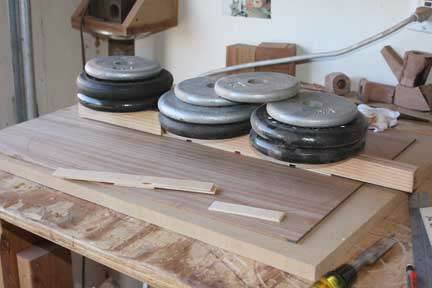 Prepare some wood glue, and have several clamps ready. 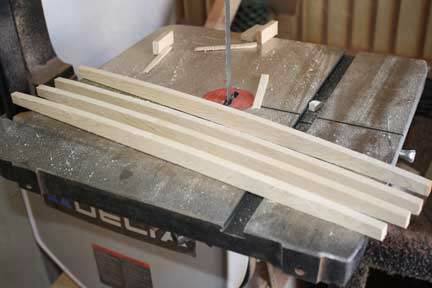 Apply a layer of wood glue evenly to the bottom of the first brace. Don’t dip this thing in glue, instead just apply a nice even layer with a finger or a roller. Then, carefully place the brace so that way it lands right on the marks. Use a clamp on each end of the brace to hold the ends down exactly where they need to be. The center should drop right in between the area you created between the overlay. Don’t let the brace slide around that way you don’t get glue everywhere. 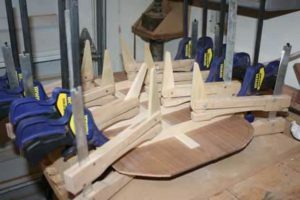 Once the ends of been pinned down, work your way back towards the center applying more clamps and creating even clamping pressure. You don’t need to clamp the heck out of each brace, you just need to hold the two surfaces together in order for the glue to dry. If you have room, you can do more than one brace at a time. Typically you have enough room to do a couple at a time, but don’t crowd yourself. The last thing you want to do is not have room to adequately clamp one of the braces. Instead, glue them down one or two at a time and then wait. Once that glue has set up, you can move a couple clamps that are in your way and go onto the next brace. Repeat this process until all the braces have been glued down. 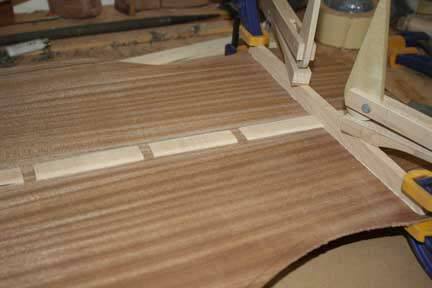 That’s how you create a center seem overlay and glue the back braces down on the back plate of an acoustic guitar. It’s a pretty straightforward process, and once you do it a couple times it will seem very easy. In reality, once you do it the first time it will feel like it’s pretty easy. Each of the pieces is pretty simple to manipulate, and this part of the guitar doesn’t really fight back as much. It’s an easy process, and once you do it you’ll feel the same way. Like anything in guitar making, there really isn’t anyone big thing you have to get right. It’s more about getting all the small things right. This includes making sure that your center seam overly pieces are glued down flush, and there are no gaps. 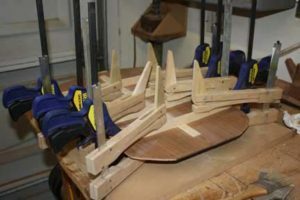 It also includes making sure that each of the individual braces are glued down well. 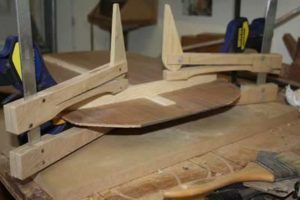 The arch on the braces is also important, as well as making sure that you clean up all of your glue residue, and that the braces are perpendicular to the center seam. Get these little things right, and your guitar will turn out just fine. Don’t be frustrated or worried about any big thing or big idea. It’s really a sum of the small things that makes an acoustic guitar sound amazing. That’s good news, because it means even a beginner can do it. Now that the braces have been glued in place, it’s time to carve them. Next week I’ll go into carving the braces, and creating a shape that both pleasing to the eye and structurally sound for the integrity of the instrument. Carving the back braces is actually a pretty easy process. They’re not nearly as elaborate as top braces, and the task is pretty forgiving. The ends of the braces get the most attention, and the middle tends to look the same from end to end. Even so, there are a few things I can help you with along the way. 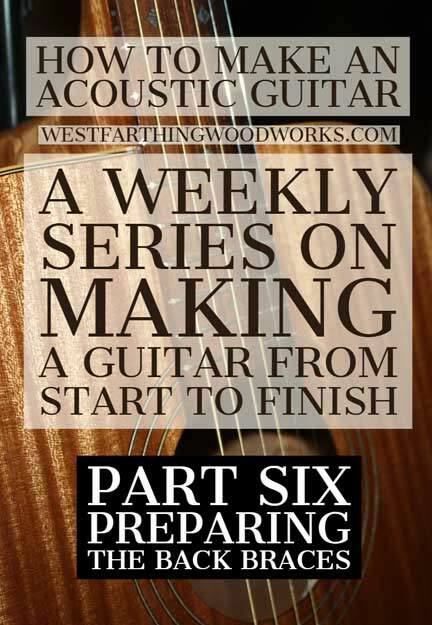 I’ll discuss all of these next week when the how to make an acoustic guitar series returns. Happy building.